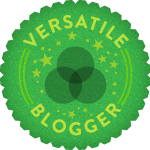 Many thanks to Larissa from Stay Dreamy blog for nominating me for the Vesatile Blogger Award !! :) It's my first blog award nomination, thank you! Thanks again Larissa for nominating my blog! Guapisima!!! Mil gracias por tu nominación!! No sabes la ilusión que me hace!!! Me encanta leerte así que es un honor que hayas pensado en mi. Congrats on the award! Yes I live in rome! Congrats, deear! You deserve this award! congrats for the award!Would you like to follow each other?Let me know, I'll be waiting for you! Congratulations on your award! Your blog is great! Congrats on the award dear, you have well-deserved the honour! Thanks so much for mentioning me, I am thrilled! It must be so exciting working as a flight attendant, I would love to hear more about that! congrats on the award. It was fun learning more about you. I collect cookbooks and love cooking too!! Sweetie, thanks a lot for nominating my blog.. I'm gonna post about it asap. I'm also into cooking and I really enjoying getting to know more about you! congrats on your award!! fun to know more about fellow bloggers too.. Thanks so much om mij te nomineren! Echt super lief! Je verdient deze award echt!!!!! Congrats for the award. This is such a great news sweetie !!!!!! Super lief van je en gefeliciteerd:)!! Ik heb je een mailtje gestuurd, heb je die ontvangen?